Hope you all are fine. 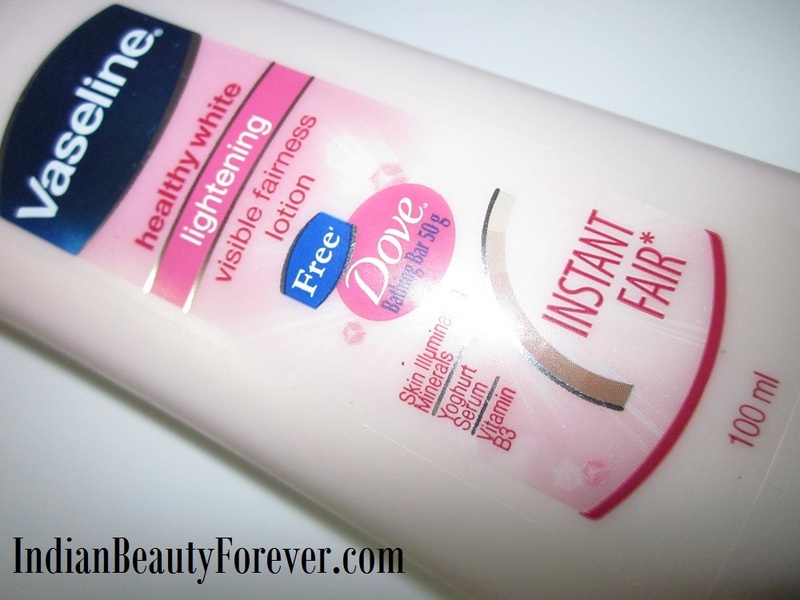 :D Today I will review Vaseline healthy white fairness body lotion which is their newly launched body fairness lotion. I was using my Enliven cocoa butter body lotion but after I got this more than 2 weeks ago and have been using it, to test and see how it fares. Price: 75 INR for 100 ml (there is an offer on this pack where in you will get a dove bathing bar 50 g) It was a PR sample so, I didn’t get it, though my mum loves Dove soap and Dove shampoos. Like the regular Vaseline packaging for body lotions, it also comes in a flat rectangular bottle with a flip top cap which is secure and tight enough so that there isn’t any leakage. I don’t have any specific reason but I kind of like Vaseline body lotion bottles. They are travel friendly and can be easily carried in the bag, if required. This new Vaseline healthy white fairness body lotion variant is meant to give not only moisturization but also claims to make skin visibly white. It says it has skin illuminating minerals, Yoghurt serum and Vitamin B3. Yoghurt is known to brighten up the skin and also removes tanning. The lotion is pale pink in color and smells just amazing! Yes, it does! I couldn’t help smelling it every time I use this after the shower. 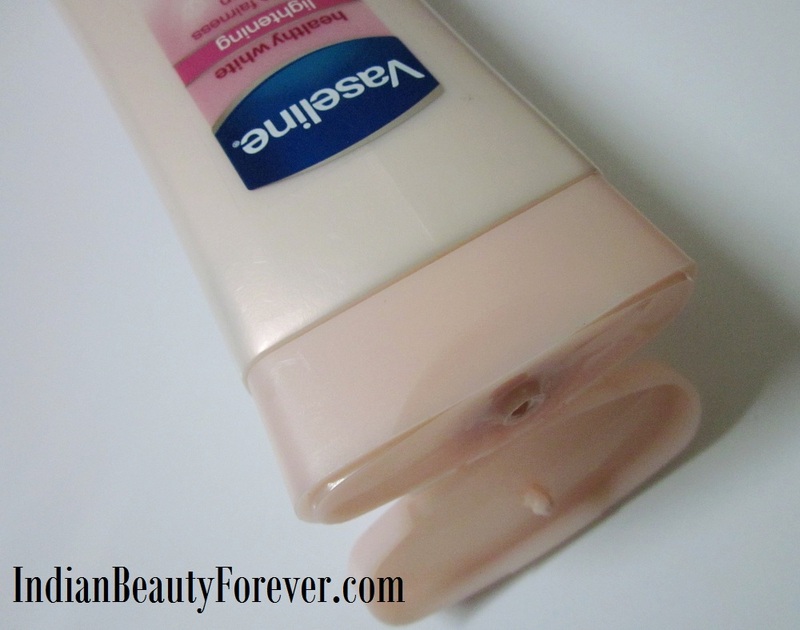 Unlike the other body lotions from Vaseline this isn’t that greasy and once absorbed it becomes matte on the skin. It seems I haven’t used anything on my skin but still the skin feels nourished and hydrated. Don’t think so it will work the same on very dry skin. 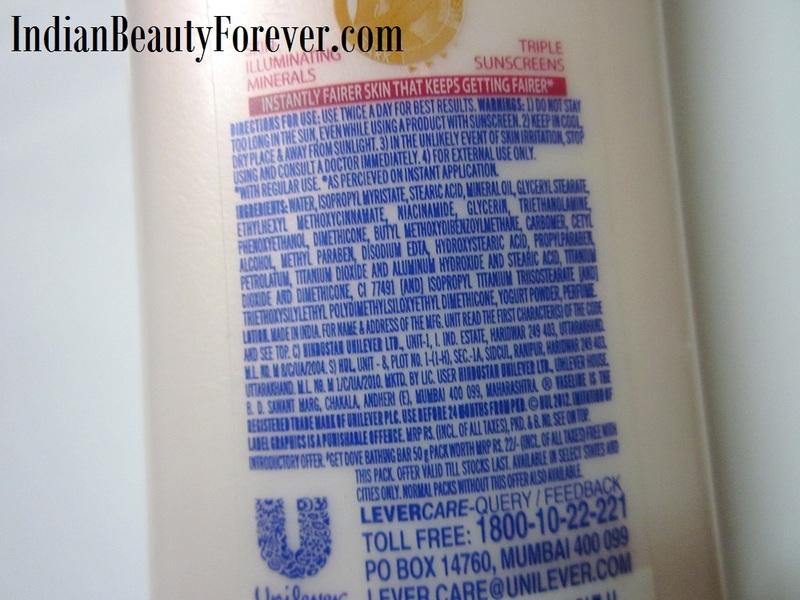 I really like it as during summers it’s good to use a body lotion that doesn’t feel greasy when you go out in the sun. Now, the fairness skin claim, I have used it for 2 weeks and I did not see any noticeable difference in the skin. May be the difference is slight or not at all. But fairness or not, I still like it for it’s great smell and the silky non greasy feel. Affordable at that price for the quantity. It contains Yoghurt serum and vitamin B3 that can remove tanning. 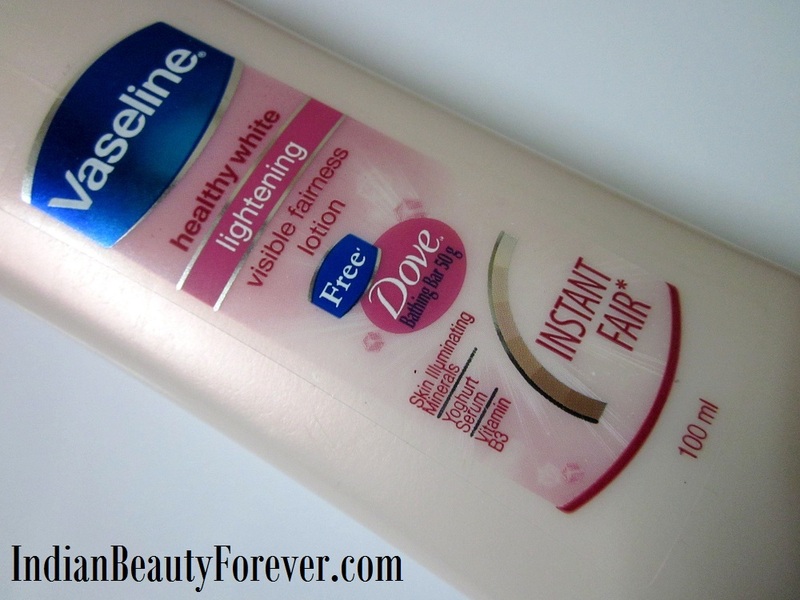 My take: If you are looking for a body lotion that provides hydration and yet doesn’t look greasy on the skin, then do try Vaseline healthy white fairness body lotion. It is worth the money and smells great though fairness claim may not be completely true. PR sample though review honest as always. Go For Avon Mineral Gems Gold Lotion.. It Gives a Beautiful Glow! Thank you Egle:) even I don't like too greasy lotions as my skin isn't very dry and that too during summers. Thanks dear. :) Even i love Vaseline products especially their body lotions. Nice Review, Even I like Vaseline lotions as you have mentioned they have sturdy packing, they are quite suitable for summer. Thanks dear. :) During summers I don't like lotions that make me greasy. I love this variant, it smells good too! Have used this when this range was newly launched. You are right, it smells great but not very moisturizing for dry skin. I liked it, but no enough to repurchase. Good value for money. I have heard their cocoa butter variant is good too. It is good for normal body skin during summers and may not give fairness but at least can remove tanning! I have used cocoa butter too and liked it! i love vaseline products..:) i hope to try it soon..! !